Black Carpet Tiles are the best choice when looking for a hard wearing commercial quality carpet tile. Our ranges include velour, rib and hobnail pile all of which are manufactured from 100% polypropylene, this fibre makes them perfect for high traffic areas. They are a successful option for busy businesses and for use in domestic situations, especially lending themselves to the more contemporary monochrome schemes. All of our Black carpet tiles are 50cm x 50cm and are sold in boxes of 20. We also offer a tiered pricing system, meaning the larger your area the more inexpensive the carpet tiles become. We find that our ranges of black carpet tiles are popular mainly because of the variety on offer. At Carpet Tiles Next Day we offer a variety of choices in black carpet tiles, we try to cater for all, as this colour lends itself to many commercial situations, busy working areas are best fitted with a low-hazard, easily maintainable flooring. 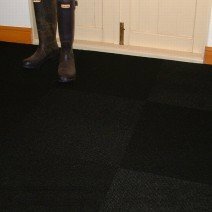 Black carpet tiles prove to be just as successful in the home, normally utilised in heavy foot traffic areas; they are ideal in situations where you have people and pets coming in from outdoors. 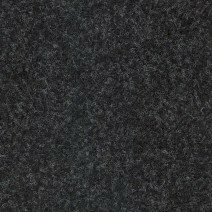 All of our black carpet tiles are produced from 100% polypropylene fibre this provides a stain resistant thread, which can be easily washed down. 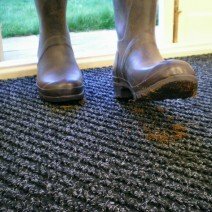 If a carpet tile suffers soiling it can be removed from the floor, washed, and then left to dry then re-laid prolonging the life of your flooring. We stock several choices in a range of value prices. We have had manufactured for ourselves, a plain black carpet tile named Jet Black, we made this decision after countless enquiries for a plain black value carpet tile, which we could not fulfil from our suppliers. The shade is exactly as the name describes, Jet Black is a sensible selection for business premises that suffer from dark stains, such us engineering companies or garages. They do not show oil marks and help to disguise swarf on the floor which you would normally expect to see on other colours of carpet tiles. They are a Fine Rib carpet tile which can be laid in several different ways, as well as being very versatile when laying alongside other colours in the same range. They give a professional, smart finish when used to make a pronounced walkway through areas such as garage showrooms or exhibition areas leading customers to the products on display. For homes with a contemporary minimalist décor the flooring would become part of the overall effect and not just a necessity. We do have another offer of black in the Fine Rib, Cosmic Black this is a very useful tile if you need black flooring, but have concerns regarding the litter and dirt that can be unsightly on the plain black in high volume areas. The Cosmic Black has the plain black base colour interwoven with a clear fibre giving them a mottled effect, ideal for obscuring particles. These carpet tiles are often used in corridors, landings and hallways, but are just as suitable for meeting rooms or utility rooms in the home. Why not lay some in your motor home or caravan. Our Velour Ash Black Carpet Tiles also utilises the black with clear flecked threads, again for the same camouflaging properties. These long-lasting carpet tiles are produced using the needle punch method. 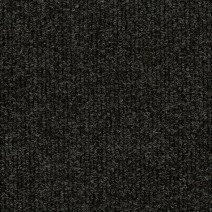 A popular carpet tile for foyers, hallways and entrance areas for industrial areas, the texture and tone of the Ash Black would also lend itself to garden rooms and home garages. We also carry a similar colour way in a Hobnail carpet tile. They are the Hobnail Crystal Black, again perfect for busy areas, the hobnail carpet tiles are durable and low maintenance. 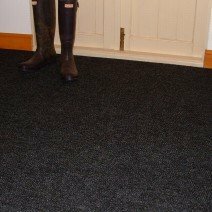 These carpet tiles are stitched incorporating a herring bone type pattern, the polypropylene fibres and tighter stitching making these our most pet friendly of the blacks, your animals claws are less likely to snag on the Crystal Black. For businesses, areas such as receptions have been carpet tiled with this selection, they are robust enough to take the constant use. If you are looking for a carpet tile to fit inside your doorway, alongside your existing carpet tiles, we can also offer a barrier carpet tile our Guardian Black. These thick, heavy duty carpet tiles act like a doormat but are more aesthetically pleasing. They can be easily removed and replaced easily if fitted safely with our carpet tile tackifier.